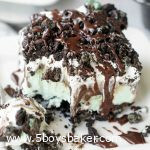 Crushed up Mint Oreos, mint chocolate chip ice cream and hot fudge sauce are what make up this completely fabulous Mint Oreo Ice Cream Dessert. 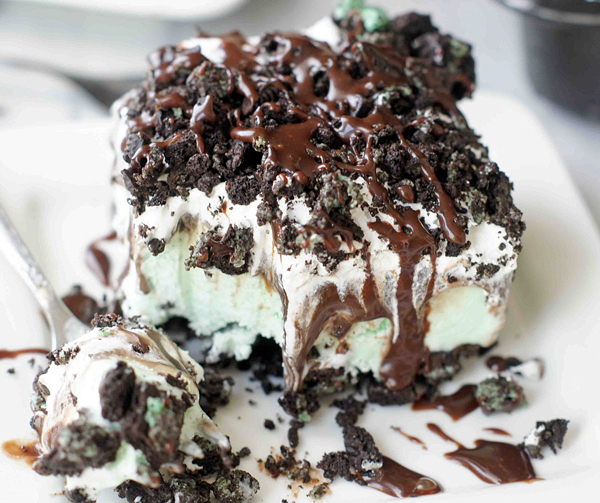 This Mint Oreo Ice Cream Dessert is kind of one of those no-brainer, not-really-a-recipe, kind of recipes. You catching my drift here? Super simple to make and can be made days ahead of time if needed. We are ice cream fanatics at our house, so any dessert involving ice cream always scores big. I actually tried making this weeks ago, but neglected to tell my boys to leave the Mint Chocolate Chip ice cream alone because it was for a dessert, and well, you can probably guess what happened. We happen to also be an Oreo-loving household so, of course, anything with Oreos ranks right up there at the top of our favorites list. Not a fan of mint? This is so adaptable to any flavor. Just use regular Oreos instead and any flavor of ice cream you’d like . .cookies & cream, chocolate peanut butter, cookie dough, etc., whatever your little heart desires. Just make sure you use a good quality ice cream. You can use your favorite store-bought hot fudge sauce or homemade. I used my homemade fudge sauce, which, I am sad to say, I have yet to share on my site (not sure why because it’s totally the bomb, so I will share it soon!). While we’re still enjoying (or not so much enjoying) these hot summer days we have left, this dessert is the perfect thing to make! Using a food processor, pulse the Oreos into coarse crumbs (or you can put them in a gallon-size Ziploc bag and use a rolling-pin to pound the cookies into coarse crumbs). Lightly butter a 9x9 pan spread a little more than half of the crushed cookies out over the bottom. Carefully spoon the mint ice cream over the top of the cookies, spreading it as evenly as you can. Spread the hot fudge sauce over the top of the ice cream. Carefully spread the Cool Whip over the top of the hot fudge layer. Sprinkle the remaining Oreo pieces over the top. Cover tightly and freeze for at least 6 hours, or overnight. When you are ready to serve, cut into squares and drizzle with more hot fudge sauce if desired. This looks fabulous and the picture is just gorgeous. I cannot wait for that hot fudge recipe–yes, please share soon! I loved hearing about the party you threw. Your husband is lucky to have you to make all that wonderful food. Made the zucchini bread a couple of days ago and it was awesome. I have never used brown sugar on top, but I will do that always as it really made the bread! Thank you! Hi Teresa! I’m so glad to hear from you. Thanks for your sweet comment. I’m so glad you had a chance to make the zucchini bread and that you loved it. The whole brown sugar thing on top is my favorite thing! I have a zucchini cake recipe on my site where I do the same thing and it’s absolutely delicious! Hope you’re doing well, take care♡! My daughter and her husband celebrate their birthdays close together. 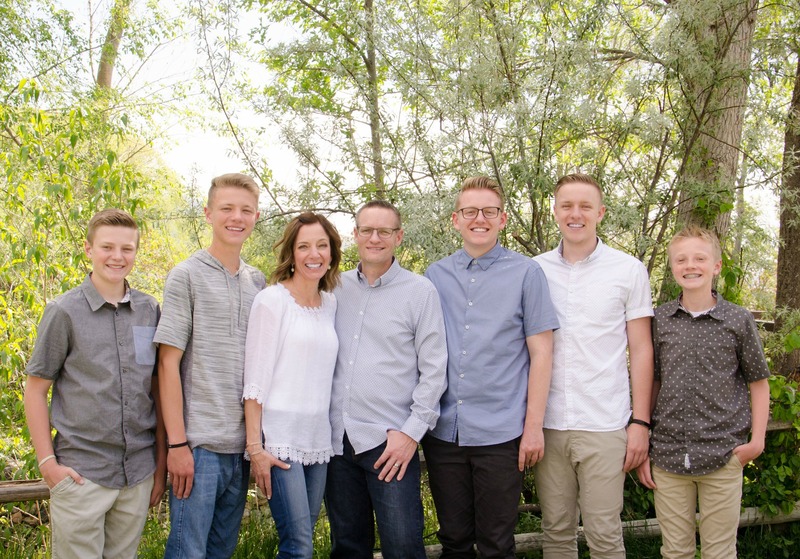 I asked what they wanted their bday “cake” to be and they first told me to look on Jodi’s blog because we always know there are delicious treats on there. Then they found this Oreo dessert so they wanted this. I didn’t have any mint chocolate chip ice cream so I used regular chocolate chip ice cream and it was to die for!!! I can’t wait to try it with the mint ice cream!!! It was the perfect “cake” for their birthdays!! Thanks 5boysbaker for always making me look good!!! I loved reading your comment Shelly! I am so happy I can make you look good my friend!